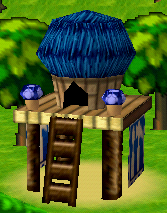 The Option House is a place in Mario Party. It is the place to change the settings, delete the data of the game, and play with various objects bought from the Mushroom Shop, such as the Talking Parrot. It seems to be home to one of the few Toads with a darker skin color. The player can toggle between Stereo and Mono for sound settings, and deleting game data is done by pulling an in-game switch. It, along with the Toad in it, is replaced by Professor Fungi and the Options Lab in Mario Party 2. The music that plays upon entering the Option House is a remix of the underground theme in Super Mario Bros.